Constance Jaeggi on Sueper Trouper. Ted Petit Photography. 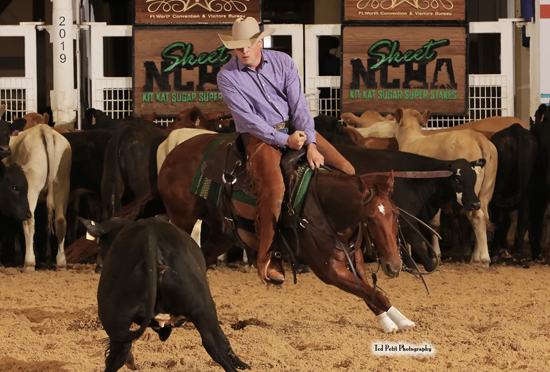 Chad Bushaw, aboard Rey Banz Gal, and Constance Jaeggi, on Sueper Trouper, tied with the winning score of 222 points in the NCHA Kit Kat Sugar Super Stakes Non-Pro Finals to reign as co-champions of the 2019 NCHA Super Stakes Non-Pro. It was the third Super Stakes win for Bushaw, who was co-champion with Megan Miller of the 2018 NCHA Super Stakes Non-Pro, and also co-champion with Paula Wood in 2008. In addition, Nadine Payne, on Blu Velvet, and Kristen Gaylean, on the The Dark Alley, tied with 219 points to split third/fourth places. Chad Bushaw on Rey Banz Gal. Ted Petit Photography. Chad Bushaw, the NCHA Non-Pro Hall of Fame earner of $3,473,019, showed last in the first set of the Super Stakes Non-Pro Finals, riding the Auspicious Cat daughter Rey Banz Gal LTE $6,856, out of a full sister to the dam of Tootsie Rey LTE $200,876. Rey Banz Gal also carried Bushaw’s son, Charles Russell, as a finalist in last December’s NCHA Futurity Amateur Finals. 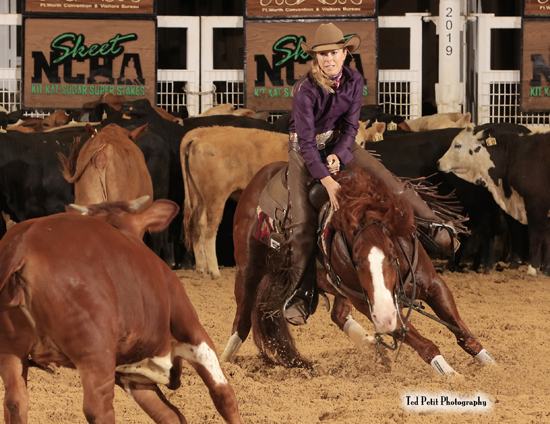 Constance Jaeggi, the NCHA Non-Pro Hall of Fame earner of $660,046, showed late in the last set of cattle riding the Dual Smart Rey gelding Sueper Trouper LTE $103,082. Sueper Trouper is the first performer out of 2016 NCHA Open Horse of the Year Ichis My Choice LTE $418,693, by Cat Ichi, owned by J Five Horse Ranch LLC. Grant Setnicka, who showed Ichis My Choice in Open competition events, also showed Super Trouper to place seventh, last weekend, in the Open Super Stakes Finals. Jaeggi rode Saguaro Ichi LTE $293,796, by Cat Ichi, as NCHA Non-Pro World Champion and to claim the 2014 NCHA Non-Pro Horse of the Year title. She also won the 2011 NCHA Super Stakes Non-Pro Classic riding Dual R Smokin, by Dual Rey. Nadine Payne, the NCHA Non-Pro Hall of Fame earner of $564,520, won the 2016 NCHA Super Stakes Non-Pro riding Velvets Revolver LTE $266,968, by WR This Cats Smart, a half-brother to Blu Velvet, by Once In A Blu Boon. Blu Velvet also carried Payne to a fourth-place finish this year in the Cattlemen’s Derby Non-Pro Finals. Kristen Galyean, the NCHA Non-Pro Hall of Fame earner of $702,847, and the 2019 NCHA Super Stakes Classic Non-Pro reserve champion on Duramax Dually LTE $156,328, by Dual Rey, won the 2014 NCHA Super Stakes Non-Pro aboard ZR One LTE $74,372, by Peptoboonsmal. The Dark Alley LTE $101,877, by Spots Hot, placed fifth in the NCHA Futurity Open Finals under Kristen’s husband, Wesley, who won the 2013 NCHA Super Stakes Open championships on Hes A Hot Cat, by Spots Hot.